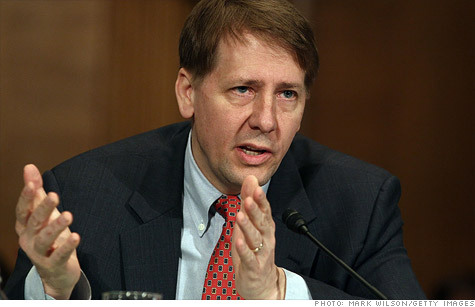 Richard Cordray, director of the Consumer Financial Protection Bureau, testifying on Capitol Hill in January. NEW YORK (CNNMoney) -- The federal government is considering a new set of rules on mortgage origination that it says would make the process simpler and more transparent for borrowers. The Consumer Financial Protection Bureau, created as part of the Dodd-Frank financial reform law, said Wednesday that the new rules will focus on mortgage points and fees, the current complexity of which can make it difficult for home-buyers to assess different loan offers. The rules would also include new standards for officials in charge of mortgage origination. "We want to bring greater transparency to the market so consumers can clearly see their options and choose the loan that is right for them," CFPB head Richard Cordray said in a statement. Mortgage origination is thought to have played a key role in the housing crisis, as so-called "predatory lenders" steered borrowers into complicated loans that they couldn't afford, which later went bust in large numbers. Originators are a focus of the Obama administration's mortgage crime task force, announced in January. Among other things, the rules under consideration would prohibit incentive payments to mortgage originators who steer customers into higher-priced loans, following on a similar rule issued by the Federal Reserve Board in 2010. Origination officials, such as mortgage brokers and loan officers, would be required under the new rules to go through training and undergo background checks. Origination charges that vary with the size of a borrower's loan would be banned. The rules will likely be proposed formally this summer before being finalized in January of next year, the CFPB said. Last month, the bureau outlined a set of new rules under consideration for mortgage servicers. These regulations would require clearer mortgage statements for borrowers and better disclosures about any fees or changes in a loan's interest rate.